Every year since 2010, we’ve sustained a tradition of selecting artifacts, photos and publications from archival collections for exhibition in the Homecoming Mini Museum on the Quad tent. 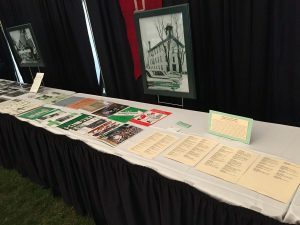 This post contains photos of the tent from the 2017 celebration so you can get a sense of the layout for items which fall into the following categories: Aerial photos, Athletics, Presidents, Professional Schools, Student Life, and all published books about IWU’s history. 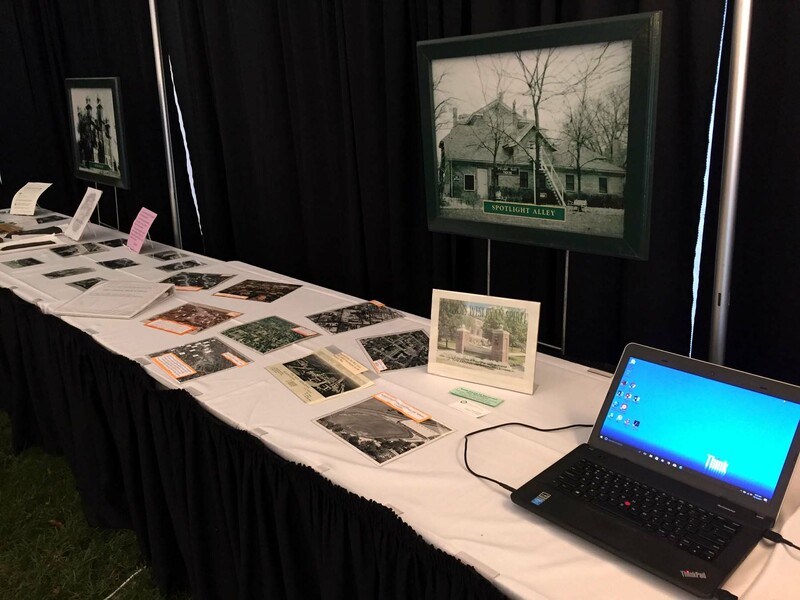 A laptop and speaker allow us to showcase and provide instruction on different types of digital collections. 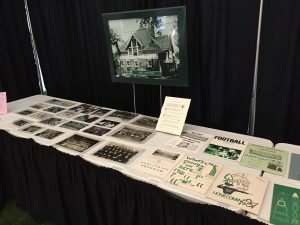 Not pictured here are round tables set up in the middle of the tent where we have bound music programs and Argus issues for the highlighted years. 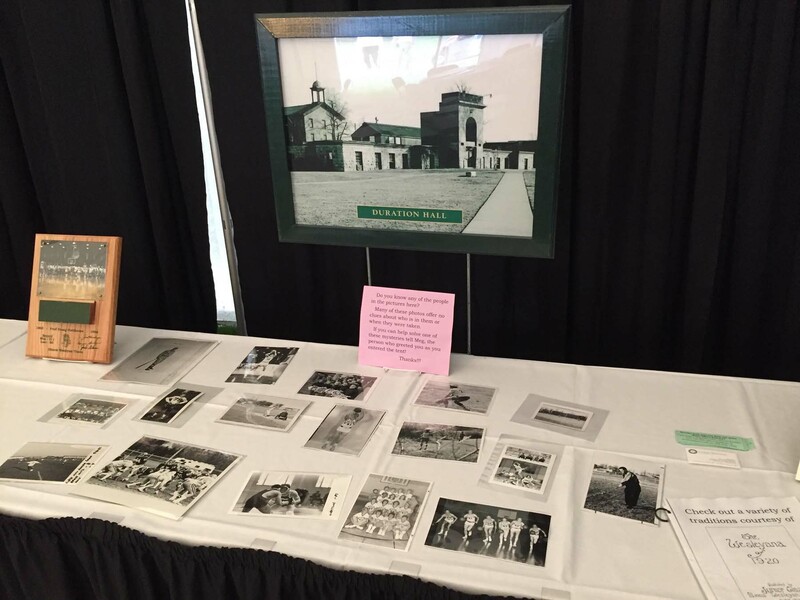 The Alumni Office staff contribute table-top photo collages and the oversized photos that stand behind the rectangular tables. The Office’s curio cabinet and its contents are on the opposite side of the tent from the Titan costume and, weather permitting, selections of Alumni Office’s supply of Wesleyanas sit on round tables outside the tent. 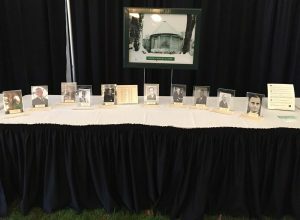 Physical Plant staff who supply the double-walled tent, lighting and transportation so these parts of our heritage stay safe for future use! As much as possible, we try to supply representative items for the groups or other highlighted aspects of that year’s Homecoming theme. 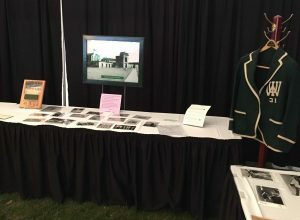 In the event that records for highlighted groups are too fragile for display in the tent, you will find them in the library’s exhibit cases. 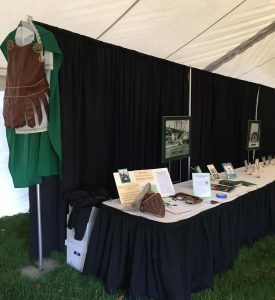 A note on collection safety: We place all photos in protective sleeves, and a sign outside the tent asks visitors to leave food and beverages at the door. 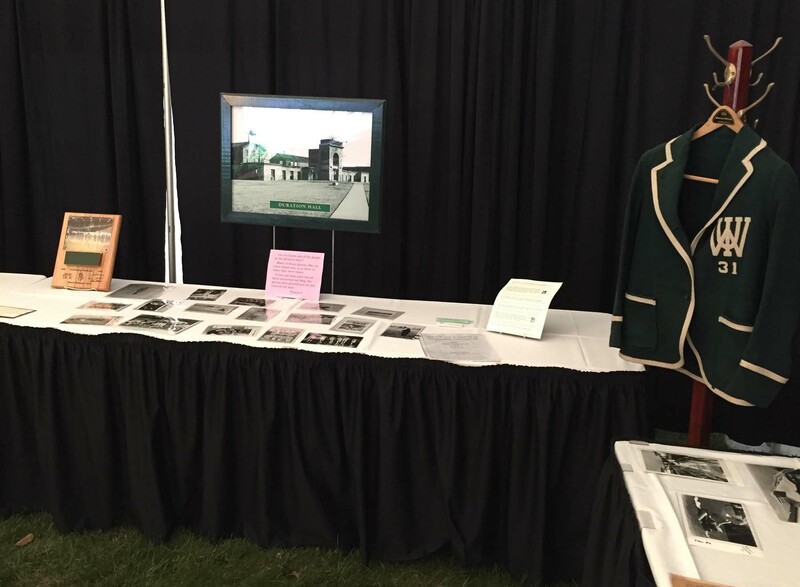 A staff member is on hand to respond to questions and monitor the exhibits. One rainy year a ceiling seam leaked and collections were quickly moved out of the way. Every year when the exhibit is taken down, materials are spread out in the archives’ workroom to re-acclimate prior to being returned to storage. This entry was posted in Alumni, Campus units, Presidents, Students, Unexplored collections by Meg Miner. Bookmark the permalink.